The only way to register is here, by completing the online registration form. You will have to register each person that would like to participate individually. All required areas on the online form, must be completed in order to register. A confirmation e-mail will then be send to you within four working days (Please take into account time differences if you are residing in a country where this applies); with this e-mail, you will also obtain our bank information. All payments must be transferred within fourteen working days, or your registration will be void and you have to register again. Your transfer information must include the keyword “Borduntage”, the Workshop and the name of the participant. (Example for a German transfer slip: Verwendungszweck (Purpose) “Borduntage”, Hurdy-gurdy – advanced ll, your name). Your registration will be binding at the time we receive your payment, we then will email you a receipt of payment within fourteen working days. Combining payment for more than one person is possible. Please ensure to add all first and last names as well as the workshop they chose. The workshop fee is 270.00 € and includes room and board (two breakfasts (Saturday and Sunday), two lunches (Saturday and Sunday), one dinner (Friday) as well as coffee and cookies (Saturday afternoon). Without boarding and breakfast at the youth hostel, the fee is reduced by 50.00 €. Youth 14 to 18 years of age and students receive a 30€ discount. To be able to receive your discount you will have to provide proof of age (passport, Id, Student ID) with name. A picture of the document is sufficient and must be send in at the same time the registration is send and contain name of the person applying for the rebate. Please send to info@nuernberger-borduntage.de. We will not accept corresponding proof after we receive the registration. The minimum age to participate is fourteen. Time of registration starts on 12 June 2018, 8 pm MESZ and closes on 10. October 2018. If there should be spots open after registration ends, the registration time can be extended. Once a workshop is booked out, we will not be able to take any other registrations for this class. However, we will keep a waiting list. You will be able to register for the waiting lists via the normal registration tool and will receive a confirmation eMail. Should a participant cancel his/her registration, the spot is offered in chronological order to persons on the waiting list. The registration and cancelation terms will remain unaltered. There is one Waiting list per workshop. You will be notified no later than 01. December 2018, if a spot opened up in the workshop of your choice. Please note that Hümmelchen (small German Bagpipes) are being used in the 2019 Bagpipe workshops. We present Schäferpfeifen and Great Highland Bagpipes at the Mini workshops. Classes conducted are exclusively geared towards Hümmelchen. Your instrument ought to be tuned to C/D. We recommend rent one of our instruments, if your Hümmelchen is not, you could only participate partially. Instrument rental for the entire of the workshops are 20 €. The rental fee has to be paid with your registration fee. If you like to take advantage of the instrument rental please state that on the registration form as the number of instruments for rent are limited. If you choose the rental option, please be aware, that requesting a rental instrument does not automatically ensure you will in fact receive one. Please wait for your registration confirmation. In case there are no more rental instruments available, we regretfully have to cancel your registration. 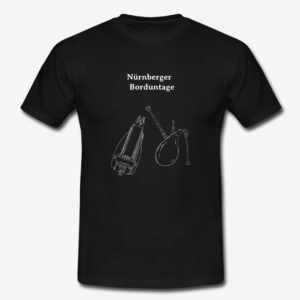 If the need should arise and you decide after registration and confirmation you do need a rental instrument (example: because yours needs repair) please contact us immediately by email info@nuernberger-borduntage.de. There is no claim on your part to an instrument, but we will do our best to organize one for you. The workshops can only be booked with meals. You can inform us on your registration, if you do not want to stay at the youth hostel. If you have other accommodations, you will still receive two lunches (Saturday and Sunday), one dinner (Friday) as well as coffee and cookies (Saturday afternoon) but NO breakfast, it reduces your registration fee by 50.00 €. No participant can demand to share a room with a specific other participant, however we do try to accommodate your wishes, but are not obligated to do so. The Information in your registration helps us to determine which persons will room together. The workshop fee is 270.00 € and includes room and board (dinner excluded on Saturday). For discounts and pricing when choosing other accommodations, please see Registration and workshop cost above. On Saturday evening we will have dinner at Finya’s Tavern. The cost for dinner on Saturday is not included in the registration fee and will have to be paid by each individual separate. All participants that expressed in their registration, to either need a ride or are able to give someone else a lift will receive an email after registration is over; in the email, you will find places from where others offer rides and their emails. We ask all participants to organize this with each other. No one has a claim on a ride with another participant. Attendees that offer or accept a ride from another attendee do so at their own risk. We cannot be held responsible for damage to luggage or vehicles. How to share the cost of petrol is up to the individuals sharing rides. There are no reduced fees for offering rides. There are also no reduced fees or refunds for persons that are a passenger of someone offering a ride, if a lift falls through or you arrive late. By submitting the registration form, the participant gives his/her revocable consent to the storage and use of his personal data for the purpose of contract. This includes e.g. the sending of e-mails by the organizer. A transfer of the stored data to third parties does not take place. The use of the data provided is in accordance with the applicable legal requirements. The participant gives his revocable consent that pictures and sound recordings of his/her person may be taken and published by the organizer. Workshops will take place with a minimum of six attendees. Workshops without the required amount of participants are subject to cancellation. Persons with a cancelled workshop will receive immediate notification. If you have not received information of a cancellation by 01. December 2018, your class will be on schedule. In case of the cancellation of your class, we will do our best to accommodate you with a similar alternative workshop. If you wish not to attend an alternative workshop, we will refund 100% of all fees (Workshop, Room &Board). The organizer of the Nuremberg Bourdon Days is not responsible to compensate for any other accumulated expenses (example: train ticket, other hotel costs). Cancellations are only possible in writing (preferable per email info@nuernberger-borduntage.de). Even if one person registered several others and payed all fees with one transfer, a cancellation is required for each individual separately. If a participant cannot attend, he or she can offer a substitute (subject to the same terms and conditions) to participate in their stead. There is no entitlement to any refund or compensation by the organizer of the Nuremberg Bourdon Days to the cancelling participant. The substitute attendee is not required to pay any registration fees and has to come to an understanding with the cancelling participant about the payment of registration fees. We will not refund cancellations after 31. November 2018 regardless of reason, including non-arriver. For reasons of equal treatment, the stated conditions of cancellation remain, even if there is a substitute in place for a cancelled workshop. A further claim for damages is expressly excluded. The organizers cannot be held liable. Participating at the Nuremberg Bourdon Days is at your own risk. Participants are not accident insured through the organizer.